While Swisscom and Sunrise have already rolled out Voice over LTE (VoLTE) in their networks and additionally support the modern EVS codec („Enhanced Voice Services“), Salt‘s network does not yet offer this improved voice mode. 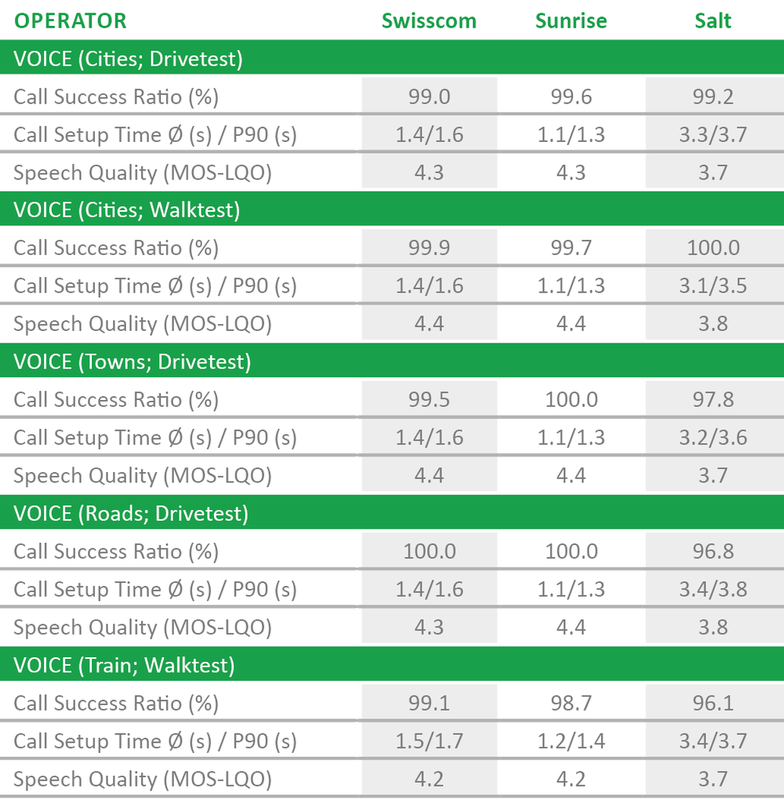 Looking at the results of the drivetests conducted in 18 larger Swiss cities, Sunrise scores ahead of Swisscom in the voice discipline. Among other factors, this might be explained with the fact that almost a 100 per cent of the test calls set up in the Sunrise network could be established via LTE – thus allowing for fast call setup times. But even though Salt customers still have to use the older circuit-switched fallback (reverting to 3G) in order to conduct phone calls, they also get high voice quality and reliability. 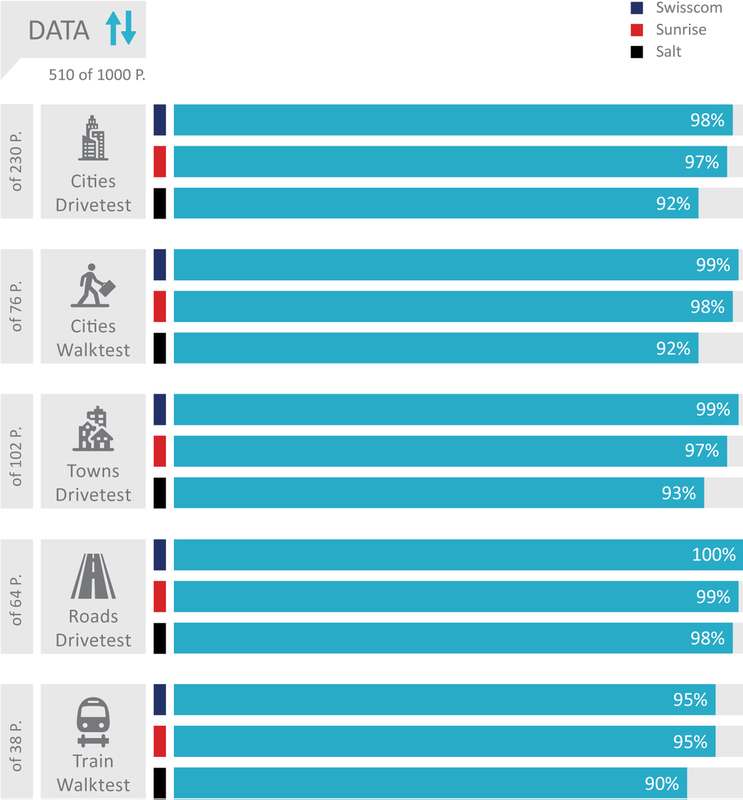 In the walktests conducted within the larger cities, Swisscom leads by a narrow margin. In the smaller towns, Sunrise is ahead. Salt manages to keep up in the examined larger cities, but when it comes to the 31 smaller towns, this smallest Swiss operator falls a little behind. Similar results can also be observed on the connecting roads, where Swisscom and Sunrise impress with a success ratio of 100 per cent. In such a strong environment, even Salt‘s high success ratio of about 97 per cent looks almost like a weak result. But as this operator also shows longer call setup times and a lower voice quality MOS, Salt overall falls a little behind on the connecting roads. 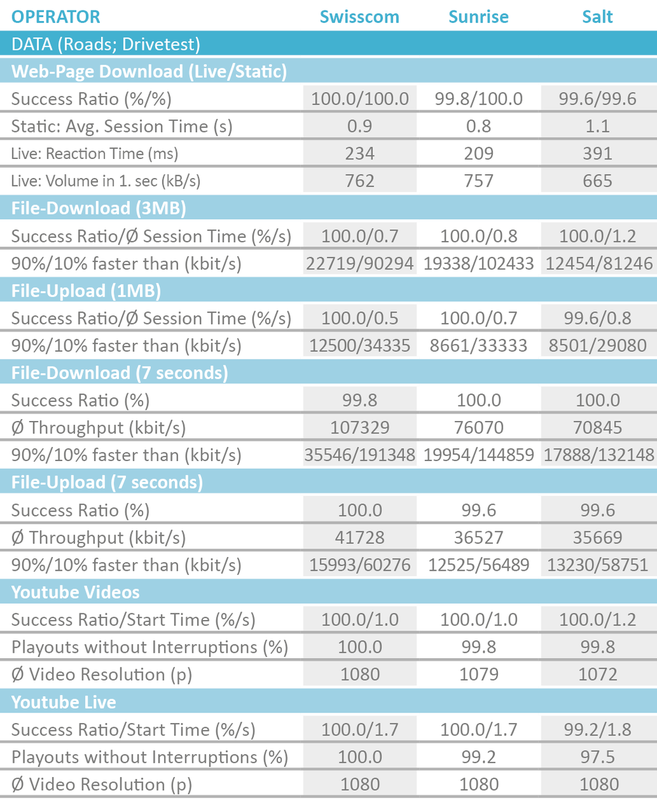 Still, the partial scores of our telephony tests all in all range on a pleasantly high level. This is also true for the measurements performed on the Swiss railways. Here, the operators from Switzerland traditionally demonstrate to their peers in Germany and also Austria what a leading performance means. This year makes no exception to this rule – particularly the success ratios and setup times of calls initiated while travelling on the trains score in a range that providers and customers from the neighbouring countries can only dream about. ONCE AGAIN COMPETE AT THE HIGHEST LEVEL. In the important discipline of data communications, all considered scenarios reveal quite a similar picture: The two top contenders Sunrise and Swisscom give each other a neck-and-neck race for the highest rank, while the smallest contender Salt follows at close distance with still very good results. In the big cities, Swisscom takes a narrow lead – both in the drivetests and in the walktests. However, all three providers achieve very high reliability rates, ranging well above 99 per cent for most of the examined use cases. In the small number of instances where this threshold is not met, the margin is only in a magnitude of some tenths of a percentage point. Market leader Swisscom achieves its narrow lead over the also very strong Sunrise mostly due to slightly higher data rates. A more detailled view at the gathered measuement results reveals Swisscom achieving a high share of connections with “4 carrier aggregation“ – downlinks on four combined carrier frequencies, which allows a theoretical maximum data rate of 900 Mbps on suitable end-user devices in accordingly equipped LTE network cells. 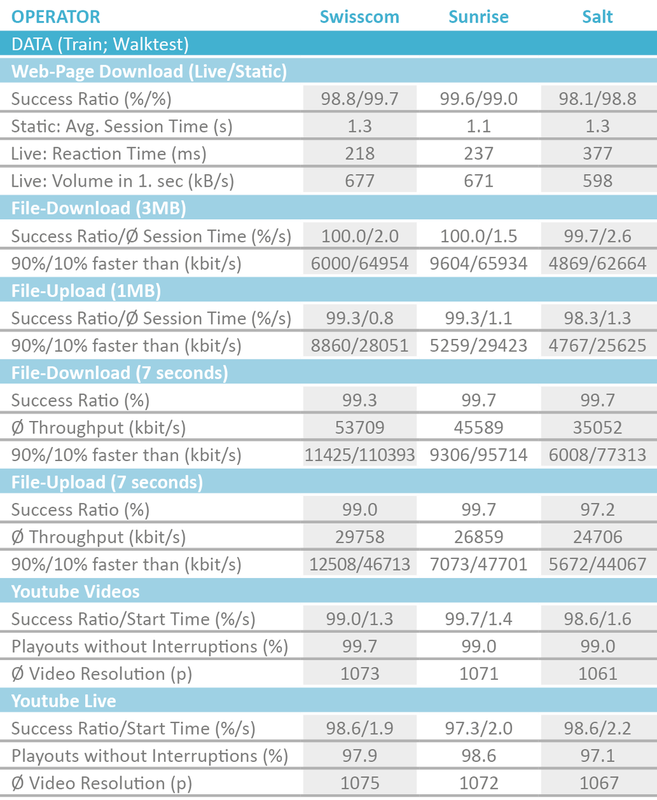 However, the average data rates achieved in the measurements are considerably lower (see adjacent table). Sunrise also offers carrier aggregation technology in a number of Swiss cities. Outside of these urban regions, the operator supplies its customers at least with up to 300 mpbs. Therefore, it is no surprise that the data rates measured in Sunrise‘s network are in a similar range than those of Swisscom. In mid 2018, Salt reported to have upgraded more than a hundred mobile network basestations to “4G+“ with up to 500 Mbps. This is indeed reflected in the data rates that we have gathered during our drivetests and walktests. The results of our measurement cars visiting smaller Swiss towns also reveal similar tendencies – and once more pleasantly good results with the same ranking that we already determined in the bigger cities. In this context, especially the high success ratios in smaller towns as well as on the connecting roads must be highlighted. Even though the data rates and reaction times fall a little behind in comparison to the urban areas, Swiss mobile customers can count on getting reliable and high-performance data connections in most rural areas and also while driving in their cars. It is particularly pleasant to observe that this is not only true for the market leader Swisscom but also for the two smaller contenders Sunrise and Salt. Swiss customers who are are looking for the highest possible performance are in good hands at Swisscom and Sunrise. If bargain tariffs are the top priority, Salt is a good choice – where customers still receive a convincingly strong network performance. As already observed during the voice tests, it is quite obvious that the described results are also valid (with only very small deviations) while travelling on Swiss railways. The walktest team covered some of the distances between the visited cities by train. In these situations, it also determined success rates of mostly over 99 per cent, comparably high data rates and fast reaction times. While railway customers in almost all neighbouring countries have to live with considerable limitations in this respect, working online while travelling on Swiss trains is convenient and stressfree. The 2019 network test once again confirms that Switzerland is well ahead in Europe in this category.